The five musicians that make up the band Ricki and the Flash are all top shelf players. Their credits are the stuff of legends; you hear them on the radio every day. Of the five, only bass player Rick Rosas and drummer Joe Vitale had played together before, as the rhythm section of the reunion tour for the legendary Buffalo Springfield (no relation to Rick Springfield). Bernie Worrell is a visionary funk keyboardist and a member of the Rock ‘n’ Roll Hall of Fame. His credits include Parliament/Funkadelic and Talking Heads. Rick Springfield is a fantastic guitarist who also played Dr. Noah Drake on General Hospital. Meryl Streep, of course, is one of the most renowned actresses in the world. To get them to be Ricki and the Flash, we set up in the World Famous Rodeo Bar in the Murray Hill district of Manhattan. 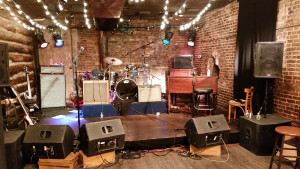 The Rodeo Bar is a long, narrow room with a brick wall behind the band. We were in a small space, and they were very LOUD. We set up the band in an authentic club configuration and laid out the monitors for them. We used three StudioLive™ 312AI cabinets for the vocalists and keyboard position and a StudioLive 315AI for the drum wedge. When we first set up the wedges, we decided to just use them in the standard DSP configuration. The speakers use Dave Gunness’ TQ™ (Temporal Equalization) settings to correct for the acoustical issues that arise in a coaxial design. In addition, each box has DSP settings designed to assist the user in different acoustic situations. There are four settings on the back of the speaker, accessed by a small button. The settings are: Normal (full range for front-of-house), LBR Source (for low-bit-rate digital audio, such as MP3 playback), Floor Monitor (for stage wedge), and a custom User preset. Neil Citron is a long-time studio engineer, guitarist, and all around great guy. He ran the Mothership for Steve Vai for 15 years and is a member of the Sapphire Group, a bunch of audiophiles in Los Angeles. Neil has incredible ears and was brought in to teach Meryl guitar, be the music director, and record the performances. Neil and I set up the wedges, supervised by Mark Wolfson, and we ran some program material through them. We really liked the sound of the default Normal setting, so we left it. As soon as the band showed up, we quickly realized that the stage mix just wasn’t “there.” A quick button-push, and the boxes were in Stage Monitor mode; they sat perfectly in the mix, with no additional EQ required. We used one StudioLive 312AI plus one StudioLive 18sAI subwoofer per side of the “house” PA. We put the top boxes on using the SP1BK subwoofer pole; this also allowed us to steer the top box to reduce reflections off of the brick walls. Thanks to Brad Graham, Rapco generously provided us with microphone cable and snakes to wire the stage. We wired the guitars using Radial JDX DIs to get the sound of the amplifier, not the guitar. We used Radial JDIs on the bass and keys. Thanks to Roxanne Ricks of Audio-Technica, we had A-T mics on the Leslie and hi-hat. We also used the fantastic A-T ribbons for ambient room miking. We had triggers on the drum kit; more about that later. Make sure the musicians can hear each other and the singers can hear their voices. Make sure the levels into the recordings were right. Get a good balanced mix for the audience. Make it feel like a real show, which it was. I’ll get into the recording aspect in the next part. I need to give major props to Gary Goetzman, the producer, who took five musicians who had not played together before (with the exception of the rhythm section) and turned them into a real band in two weeks. Everyone was at the top of their game, and the professionalism of the band and producer really shone through. Hello everyone, I’m Phil Garfinkel, the Special Projects Liaison for PreSonus® Audio Electronics. I’m writing about the shooting of a new movie, Ricki and the Flash, discussing the PreSonus products that we used and how we used them. 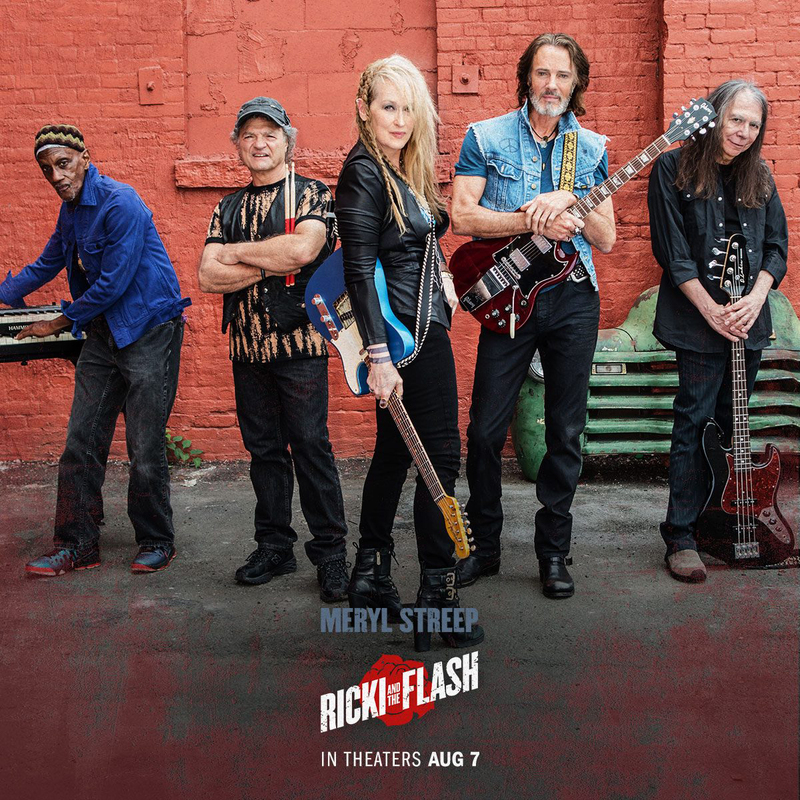 First, a little about the film: Ricki and the Flash stars Meryl Streep as Ricki, an aspiring rock star who leaves the Midwest to “make it” in California. Her band, The Flash, features the talents of Rick Springfield on guitar, Bernie Worrell on keyboards, Joe Vitale on drums, and Rick Rosas on bass. 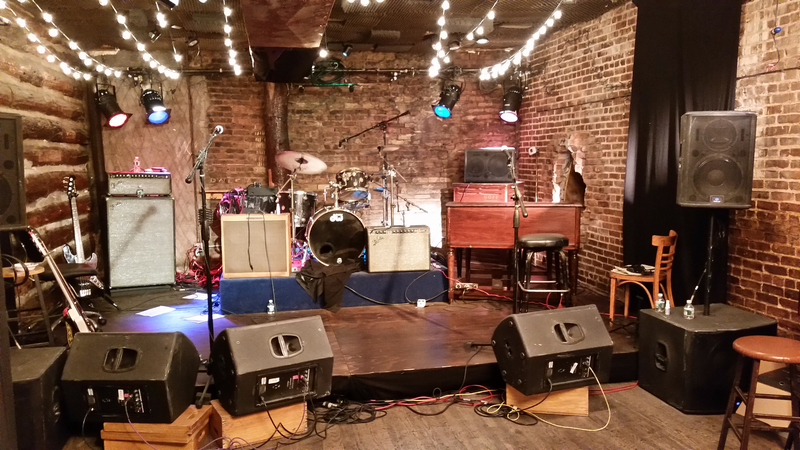 We set up the band in an authentic club configuration, with plenty of PreSonus equipment to reinforce their sound. We recorded with Capture™ and used Studio One® to create reference recordings. I was on site as the PreSonus tech, mixing the live show. The movie is directed by Jonathan Demme and produced by Gary Goetzman and Marc Platt, all Oscar winning veterans. Jonathan and Gary wanted the band to play, not just pretend to play along to tracks; I was brought in to mix front-of-house and monitors and to take a 32-track feed to capture the music as it happened. We faced some unusual challenges. Thanks to teamwork and a mutual obsession for excellence (and some pretty great gear), Mark, Neil, and I worked through it to help Jonathan and Gary make an excellent soundtrack for the film. Special thanks to Roxanne Ricks at Audio-Technica for helping us get high quality microphones and wireless systems, Peter Janis at Radial Engineering for getting us some fantastic Direct Boxes, and Brad Graham at Rapco-Horizon for helping with cable needs. Thanks also to my cohorts in audio-land, Mark Wolfson and Neil Citron, who led the charge for this journey. Also Jeff Pullman, C.A.S, the film’s Production Sound Mixer, who worked with us. Ricky and the Flash opens in theaters everywhere on August 7. Special Offer On StudioLive AI Loudspeakers in the USA – save up to $1,000! No matter how you slice it, that’s a savings of $250 a piece for some incredible speakers. The StudioLive AI PAs feature our Active coaxial loudspeaker design, as well as sophisticated networking and DSP. 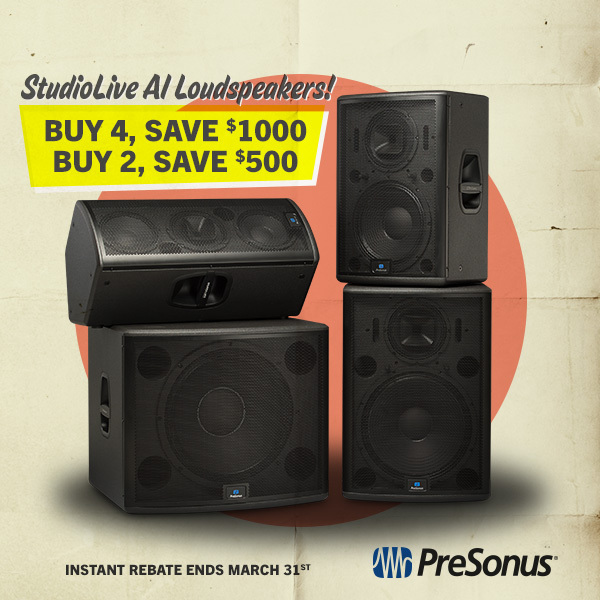 With free PreSonus SL Room Control software, you can configure, tune, and monitor networked StudioLive AI loudspeakers from anywhere in the venue—Click here for a video on that. You can even visually display the room layout on a laptop or iPad! But the StudioLive AI Loudspeakers aren’t just about brain—there’s a lot of brawn here, too. And when it’s time to put some boom in your room, these speakers offer irresponsibly high power—without the breakup and distortion typically associated with chest-resonating high volume. For more details on the minds behind the StudioLive AI Loudspeakers, click here for an interview with Dave Gunness. PreSonus offers you a full solution for jazz band rehearsal and recording. Take a look at how the Louisiana All State Jazz Ensemble takes advantage of the StudioLive AI family! Today, Midi Music has hosted an important event for the Italian key dealers featuring the two main new products recently introduced by PreSonus: The new generation of StudioLive RM Series Rackmount mixers, and the new range of StudioLive AI PA Loudspeakers. About 50 retailers and operators, as well as journalists from Italian commercial audio magazines attended the event. Francesco Galarà, Midi Music’s new product advisor for the Pro Audio division, described the philosophy and technical characteristics of the RM series, focusing on the unique features and intuitive ease-of-use offered by UC Surface. He also addressed the versatility that makes StudioLive RM16AI and RM32AI suitable for applications in different fields: live sound, studio recording, radio and TV Broadcast, and system integration. After going deep into the specific details of CoActual and Temporal Equalization technologies, it then has been the turn of the set of StudioLive AI PA speakers. We conducted a listening test, covering various genres of music from pop to rock, from the classics to jazz and then—the icing on the cake—Tchaikovsky’s famous “Waltz of the Flowers,” which was very suitable for highlighting the magnitude of the StudioLive AI Loudspeakers’ dynamic response, linearity and definition playback—all without compromise at any listening level. The clarity and definition immediately captured the attention and curiosity of the audience, who remained long after the demo with many questions and insights about the features and capabilities of both products. The event was followed by a nice dinner party, with typical Italian seafood and a fine Piedmont Hills wine selection, offering the participants another opportunity to continue to deepen the discussion about technical and commercial aspects of PreSonus products. The Blue Devils Win Big with Record-Breaking Score of 99.65! 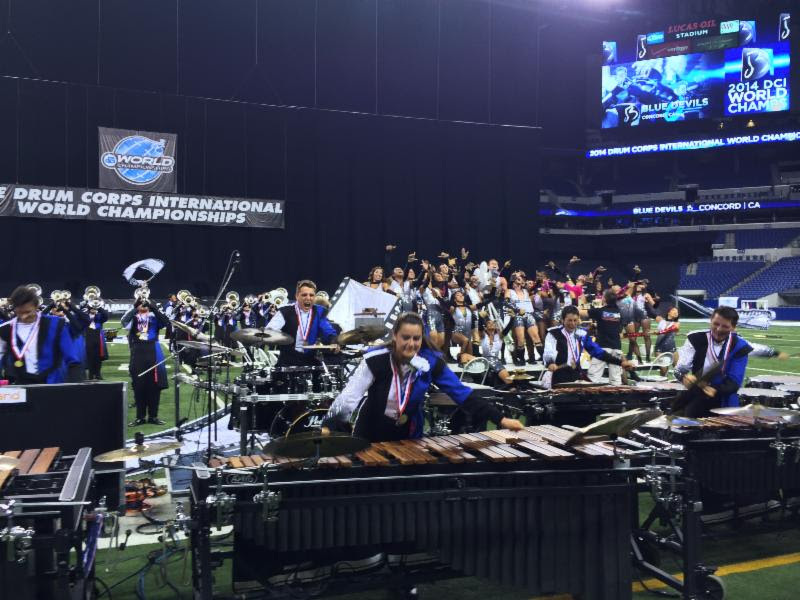 The Blue Devils Drum and Bugle Corps won their 16th World Championship on Saturday with a record-breaking score of 99.65—the highest in the history of the competition! The PreSonus family is extremely proud of the organization, and we have the utmost respect for the members and staff who worked tirelessly all summer and kept improving until the very end. Congrats! Check out this video of the Blue Devils doing what they do best with the support of the PreSonus StudioLive AI mixers and loudspeakers. LOS ANGELES: Come on out to PreSonus Exchange Live! Here are some photos from the 2nd L.A. PreSonus Meetup. We had an open mic for anyone to perform on. We recorded them via Capture, and the entire show was run through the StudioLive 32.4.2AI and StudioLive AI PA speakers. We were then able to open up their songs in Studio One for quick mixes. This is only the second event like this we’ve done, and we had double the turnout of the first! If you live in the Los Angeles area and are interested in PreSonus, industry networking, or both, you should come on out to the next event; they are hosted monthly. You can learn more and sign up at our Meetup.com page by clicking here. Hey PreSonus! I just wanted to say thank you for your support of Baton Rouge Gallery and its Movies & Music on the Lawn series. This past weekend we were, as you know, pleased to screen “The Man Who Laughs” with an original score from Matsy. The weather was perfect and we had an audience of over 400 on hand for the event! We’ve gotten such wonderful feedback at the gallery about the event. I know we had a number of people use the free passes, so I’m assuming that a number of PreSonus staff/clients were able to come and enjoy the evening. Again, on behalf of the artists, staff and Board of Directors at BRG, I would like to express our sincere gratitude to you and everyone at PreSonus for the generous support. I hope that you are as proud of the partnership as we are. I’ve attached some photos of the event. We hauled some video hardware down to Vegas for InfoComm and shot some vids at the booth. If you couldn’t tune in to PreSonus LIVE for this coverage, you can catch it all below! Learn a bit about StudioLive AI Mixer Cascading, Dante, and the latest member of the PreSonus fam’—WorxAudio! While you’re at it, here’s a the full press releases from our InfoComm 2014 announcements.